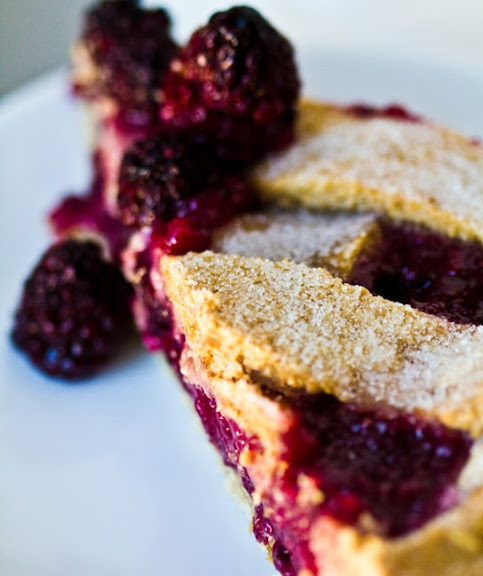 Fresh Blackberry Pie! It's Vegan, and Oh-So-Trendy. Cupcakes are out, pies are in! At least that seems to be what all the 2011 Food Trends articles are forecasting. And if Rachael Ray, Betty Crocker, the Huffington Post and NY Daily are saying it's true, well then we all better believe it! 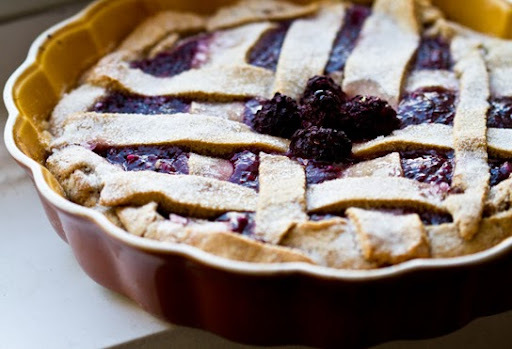 So I decided to make a Fresh Blackberry Pie - to feel oh-so-trendy. 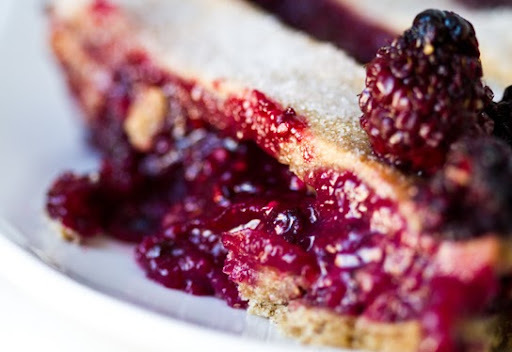 But really, does a dessert get any more classic than fruit pie? Today's takeaway lesson: classic recipes are trendy. Weird. But I'll take it. Perfect excuse to make pie. 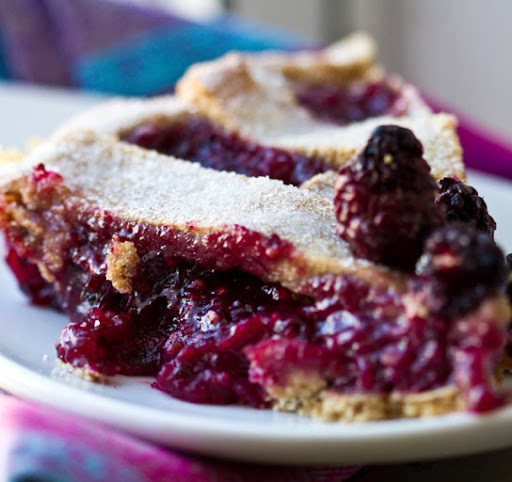 So lets get into a 1950's mood, roll up our sleeves, pound out some fresh pie dough, run a colander of ripe berries under the faucet, tie on our ruffled white aprons and get those pies in the oven! 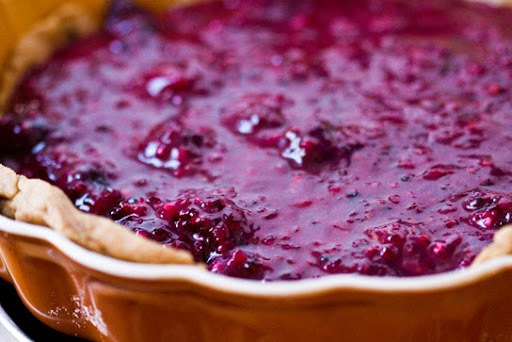 Vegan Berry Pie. 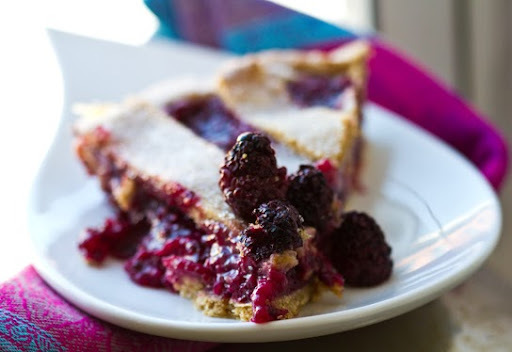 I must admit I have always been a sucker for a thick slice of fresh baked berry pie. 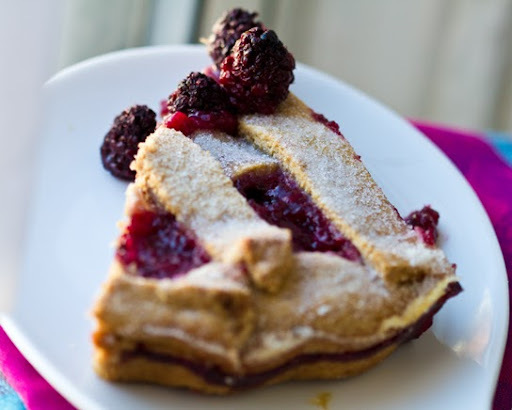 While my sister was ogling the Chocolate Cream Pie on the dessert tray, I was eyeing the Razzleberry slice - the fluorescent pink filling oozing out between flaky crust layers. 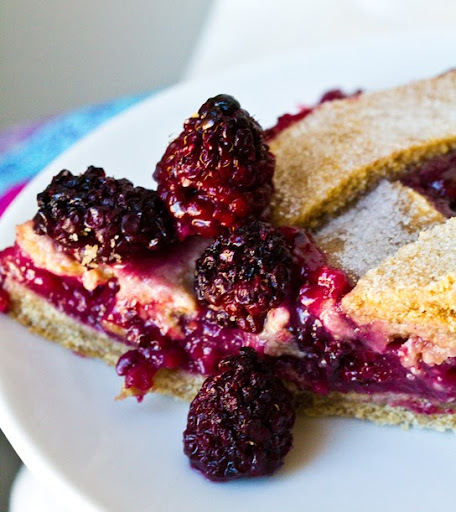 And even today, I adore diving into a zingy (veganized) Berry Pie, with a crust that tenderly cuts with just a wobble of my fork. 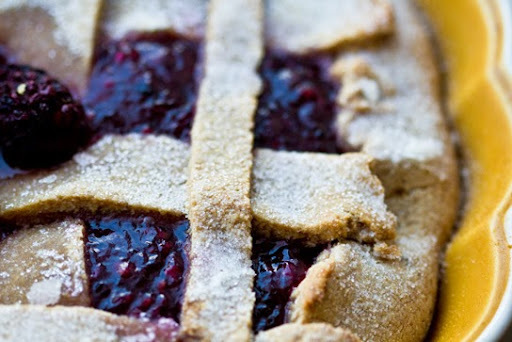 Blackberry, raspberry, blueberry and even cherry pies are my favorite. So I grabbed three pints of blackberries and started the fun - (yes, I know blackberries are not in season, but don't mess with a girl and her pie craving.) If you want to tweak this recipe and use something more seasonal like apples or even cranberries, go for it. Hmm, cranberry pie - has anyone ever done that? The Crust. I don't use any appliances to mix my dough. I first press it out with my fingers and finish with a rolling pin. But if you do have a nifty counter top stand-mixer appliance you can use it. I'm really just winging it in my not-so-much-counter-space NYC apt. But inside I'm secretly oh-so-jealous of your in-kitchen elbow room. I wing it when it comes to my crust. I may have specific ingredients, but I am less looking for perfect measurements and more for a desired dough texture and weight and wetness. So I'll still give you my 'recipe' - but realize that you may be adjusting water/flour/oil on your own. What I look for in my pie dough: wet enough to knead, but dry enough to handle without having a sticky mess when you roll out the dough. The surface of the dough should be shiny, yet dusty. My trick is to countertop-soften the vegan butter so that it melts into the flour without being an oily mess. So now onto the easy part: The filling! So simple. 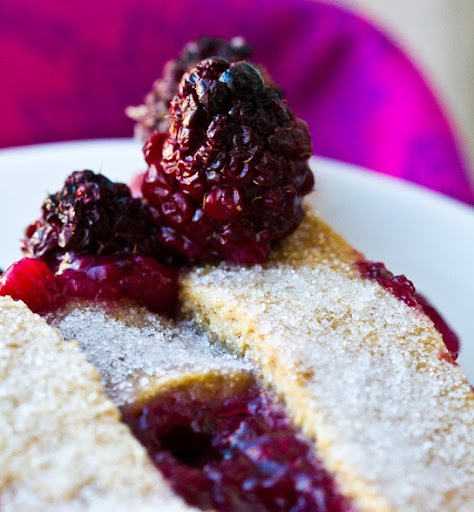 I use a wide skillet and simply heat the berries with sugar and other ingredients to thicken. The filling takes under ten minutes to prepare. Why Pie? 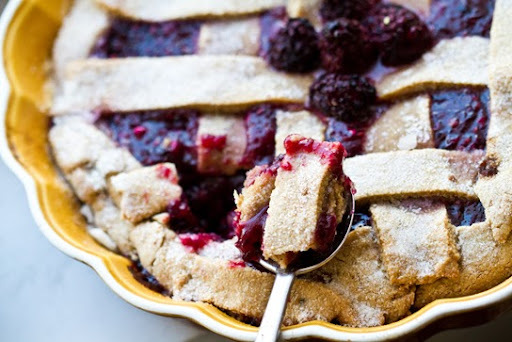 So why is pie so trendy? Well I think we all love taking 'classics' and updating them. Plus pie can be interpreted in many different ways! You can do sweet pies, savory pies, hand-held mini pies, pie pockets, crust pies, crumble pies, and even crustless pies. So many options to keep our creative juices flowing in 2011. Goodbye cupcakes! Hello pie. 1. First prepare the pie filling. I like leave 1/2 cup of berries out - to add later. 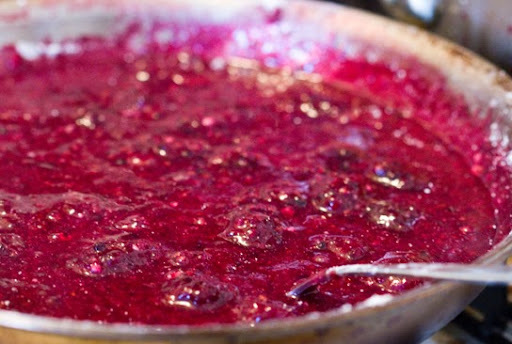 Add your berries, buttery spread, salt and sugar to a deep skillet over medium heat. 2. 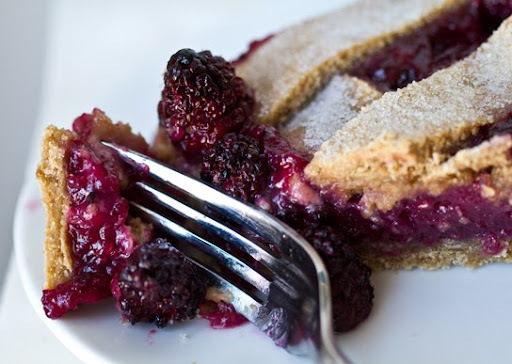 Using a fork, mash down the blackberries until they are all smashed. Bring this mixture to a simmer. 3. Mix the maple syrup, apple juice and corn starch/arrowroot in a glass. Dissolve the corn starch/arrowroot as well as your can. Add this liquid to the fruit mixture skillet. Also sprinkle the flour over top - and stir well. Continue to simmer and stir as the berries thicken - for about 2 minutes. Then turn off the heat. Add in the reserved 1/2 cup of fresh blackberries and fold them into the heated mixture. (note: I leave out 3-5 fresh berries out for garnish.) The filling will thicken even more as it cools. Set aside while you work on the crust. 4. Preheat your oven to 375 degrees while you work on the crust. Combine all the flour ingredients in a mixing bowl and fold with a spoon until a plump dough forms. As mentioned in this post, it is a great skill to be able to "wing-it" when making dough - instead of using always having to use precise measurements. Once you know what texture/wetness/weight you are looking for, you really won't need to follow a recipe. Add water/flour to adjust as needed. 5. 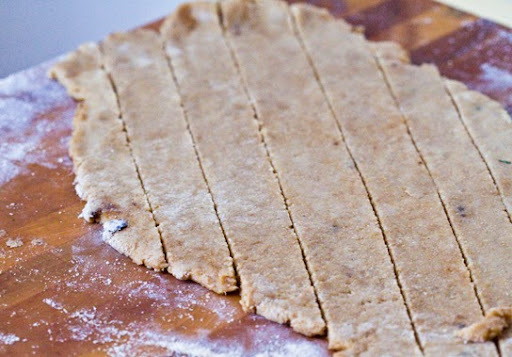 Roll out your dough in two sections. One for the bottom layer of pie crust and one for the weave on top. I press out the dough with my fist/fingers, then roll it out gently until it is the desired thickness. For the weaves, I use a knife to slice into strands. 6. 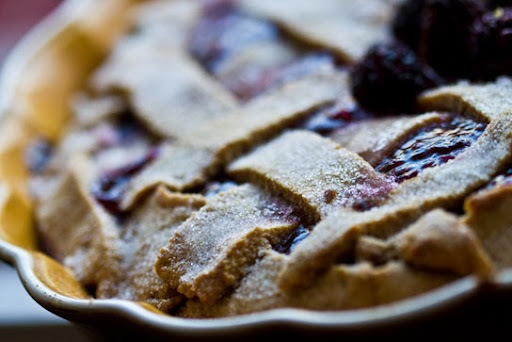 Spray a pie dish with canola oil, then lay the bottom pie crust flat. I like a deep dish because I know the pie filling won't bubble over the sides - but you can use any size dish you'd like. Press dough around the dish edges to make it look at pretty as you'd like. Rustic-looking crusts are OK too. 7. Pour your cooled pie filling over your crust. Then lay the weave strands on top of that. Do a light spray of canola oil over top the weaved crust and sprinkle with sugar. 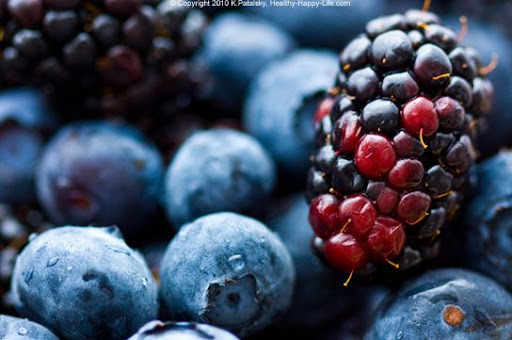 Garnish with whole fresh berries in the center of the pie. 8. Bake at 375 degrees for 30-40 minutes or until crust begins to turn light brown. Cool before serving. 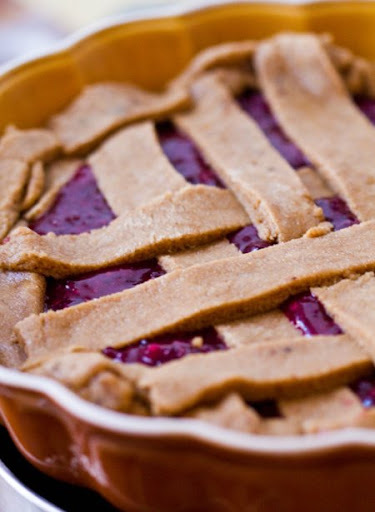 Store pie in fridge. The pie will firm up nicely in the fridge. Allow slices to come to room temperature before serving for best taste results. OK, it is kinda trendy-looking. This pie is rad..